Don’t know about you, but we have our laptops, tablets and phones, used more or less at the same time as we type away at work. They all require keyboard inputs, and while touch screen keyboards have come a long way, they still don’t quite match the feel of a QWERTY keyboard. Kanex have come up with the ideal solution to the problem, and we are quite surprised that such devices aren’t in all offices! 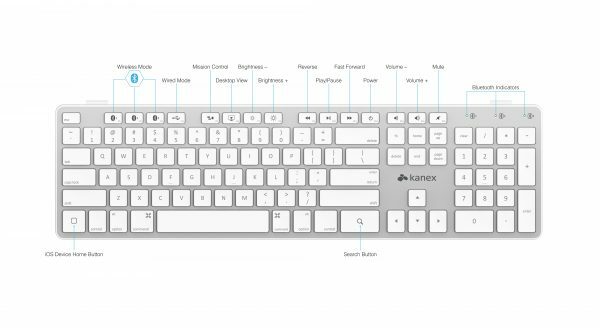 The Multi-Sync Keyboard from Kanex allows you to connect it to one laptop, and connect up to three Bluetooth devices to use with it. On top of that, it also gives you shortcut keys which allow you to control various features on your laptops as well as devices. We have checked with Kanex, and while the adverts say it is designed for Apple devices, it works with PCs as well as other Bluetooth enabled devices such as Android phones and tablets. However, as expected (at least for anyone who has tried this in the past), some of the shortcut keys don’t work. Another thing they discovered that the recent Apple firmware update – iOS7 – causes the search button on the keyboard to stop functioning with iPhone and iPad. The spotlight search field now comes from the top of the screen. So you can just swipe down, then start typing. It will still function with iOS6. In Android, the search function still works. 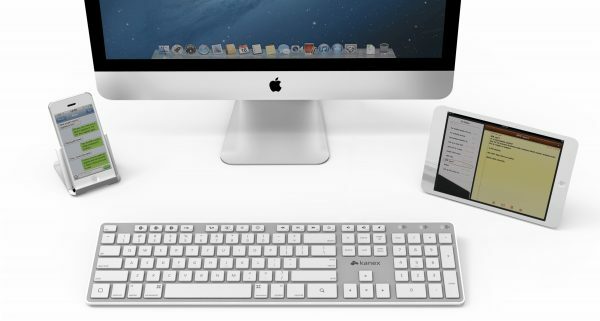 Merging with the rest of the Apple looks, the keyboard gives you a low profile to type on. The keyboard also comes with a folding iPad/iPhone stand, which can be adjusted for typing or viewing. The angle can be adjusted, and when not in use, it can be folded and put away.